Welcome to the final night of week 4 in our charity challenge. Before we get started if you’d like to donate or learn more about our campaign check out our campaign page here. Tonight is a strange night in the competition, in order to win the competition we need to win 3 games next week. That’s it, everything else is noise. BUT the first game of week five will be decided by the person who loses tonight. The result is you almost have a game tonight that you want to lose, if only we weren’t so competitive. But it’s playing on our minds that next week, week five, is what really matters. Because tonight is a little bit of a bizzaro world we’ve mutually agreed to play one of the worst games in our collection. 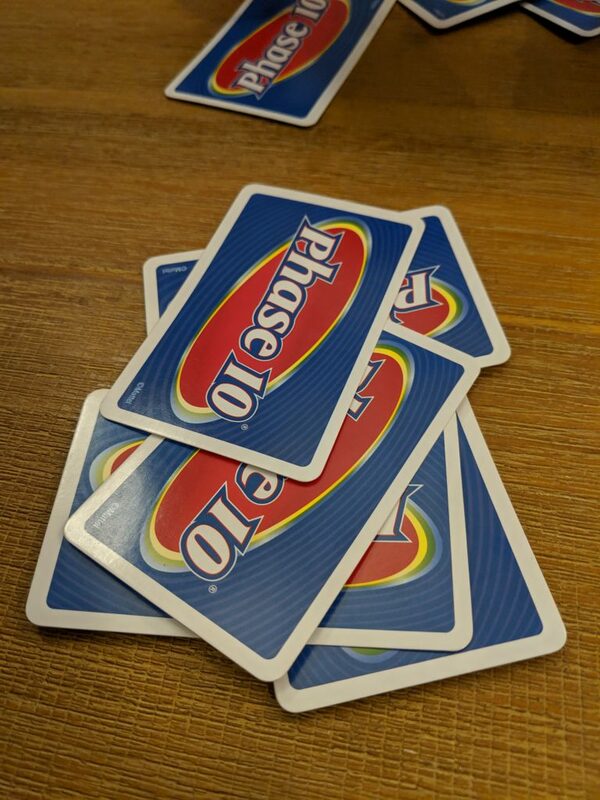 Tonight, for reasons that escape me, we’ve agreed to play Phase 10. 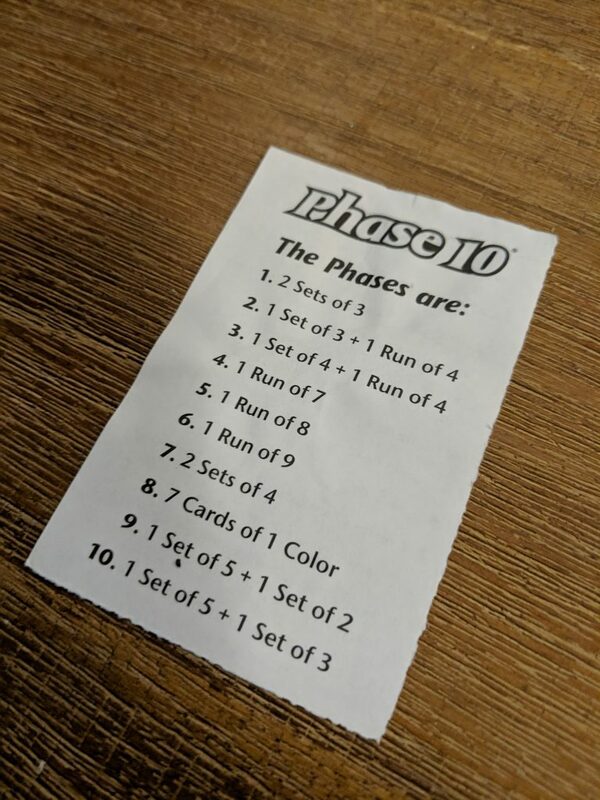 In Phase 10 players have to meet various criteria, working their way through 10 rounds or phases. In the first round players need to hit two sets of three, after that a set of 3 and a run of 4. It goes on from there. The one curve ball that you have to contend with though, if your opponent manages to meet their phase and gets rid of all of their cards before you meet your phase you stay locked in your current phase. Not. Great. It’s a very unforgiving game and luck plays a strong part. The first few rounds were fairly routine with Rachel and I keeping pace with one another. 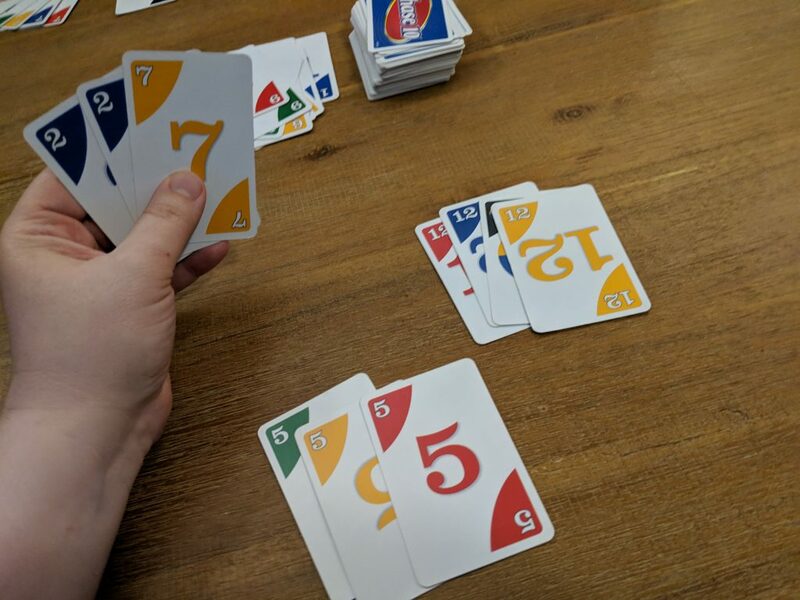 In round 4, where players need to get a run of 7, I managed to get my 7 and get rid of the rest of my cards before Rachel completed hers. She was now a phase behind. After that I managed keep on trucking and took advantage of the lead I had eked out. Truth be told I got really look pulling wild cards and tonight luck wasn’t on Rachel’s side. Well. She’s got the advantage of picking the first game of week 5. See you in week 5 when we reach the exciting conclusion of this competition!